The cigarette stocks remain hot as high yields and steady growth have led to strong stock gains. Many an investor has overlooked the sector due to perceived negatives of the industry, but for an investor looking for yields and growth the sector should not be ignored. Disclosure: Long LO. Please review the disclaimer page for more details. Any time a stock falls 50% shortly after an IPO one has to wonder if the market isn't offering a bargain now. Currently the IPO process is so subjective to market forces and short-term market momentum that a stock can move 50% in either direction irrationally. Typically the process of deriving the offering price is built for obtaining a reasonable price though it usually leaves money on the table for those buying at that price. In the case of Marin Software (MRIN), investors at the IPO price haven't seen much to smile about as the stock peaked at nearly $20 on the opening day and has done nothing but drop to $10 in the three months that it has been public. As the Federal Reserve hints at tapering the bond buying program over the next year, cyclical stocks including energy exploration and production firms should become interesting buys. These stocks have underperformed the market rally over the last year as investors have piled into high yielding stocks as bond yields hit extremely low levels. Now that money should flood out of those stocks and bonds into growth stocks. Disclosure: No positions mentioned. Read the disclosure page for more details. As the Federal Reserve hints at tapering its bond buying program over the next year, cyclical stocks, including technology, should become interesting buys. Tech stocks have underperformed the market rally over the last year as investors have piled into high-yielding stocks to counter low bond yields. Now that money should flood out of those stocks and bonds into growth stocks. 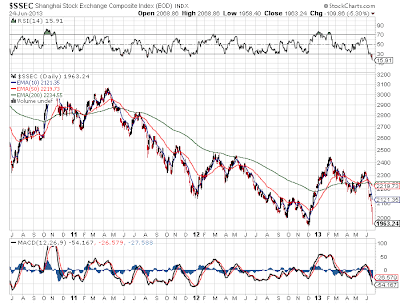 The Chinese stock market has absolutely collapsed during June and especially the previous couple of days. The composite has dropped from 2,300 to 1,963 in less than a month. Not very often does a major index trade with an RSI of 15. This drop has hurt most commodity and emerging growth stocks during this month. Some interesting buying points might have been reached for coal and copper stocks. Those stocks are at least worth a look. Recently Jack in the Box (NASDAQ: JACK)disclosed that it would close 67 Qdoba stores for a cost of $40 million in impairment and severance charges. With a turnaround at the Jack in the Box concept, one has to wonder if management knows how to operate Qdoba. As the Federal Reserve hints at tapering the bond buying program over the next year, cyclical stocks including technology should become interesting buys. Tech stocks have underperformed the market rally over the last year as investors have piled into high yielding stocks as bond yields hit extremely low levels. Now that money should flood out of those stocks and bonds into growth stocks. Disclosure: Long INVN and MM. Please review the disclaimer page for more details. Nothing like a name change to make the market forget about a previously hot stock. Back in May, Heckmann changed its name to Nuverra Environmental Solutions (NES) to more accurately reflect its focus on environmental solutions in the energy sector. The stock has done nothing but plunge since the beginning of June whether due to the sector weakness or the market losing focus on the 'new' company. Either way, the stock is trading at lows not seen since the revolutionary merger that combined Heckmann with Power Fuels back in the summer of 2012. Discloure: No positions mentioned. Please review the disclaimer page for more details. Kmart is really on a roll with these commercials if they don't turn off consumers that lack a sense of humor. After the "Ship My Pants" commercial, this new "Big Gas Savings" is humorous. Now if it would only drive consumers to the stores. Remember that Kmart is an arm of Sears Holdings (SHLD). Not sure this commercial adds any sales for Kmart.com, but it sure is funny. Remember that Kmart is a part of Sears Holdings (SHLD). Any commercial that attracts users can't be bad at this point. Disclosure: No positions mentioned. Please read the full disclaimer page for more details. With all the recent news regarding the potential buyout of SodaStream (NASDAQ: SODA) by the beverage industry giants PepsiCo (NYSE: PEP) or Coca-Cola (NYSE: KO), one needs to keep an eye on whether or not that is even desirable. The home beverage machine maker still has tremendous growth left in the Americas, where soda consumption per-capita leads the world and greatly exceeds its home base of Western Europe. Even after gaining 7.7% on Friday based on rumors that Apple (AAPL) is ramping with its products, InvenSense (INVN) still has more room to run. The stock is approaching 52-week highs around $16 and only spent a few weeks in the last year above the current price of $14.65. The maker of motion sensing technology has been long on potential ever since going public back in November 2011. The stock has struggled though due to the inability to correctly forecast earnings and a disconnect on the future of Apple as a customer. In fact, analysts have spent the last month dropping earnings estimates even though the noise in the market suggested a constant increase in a top producer of consumer goods as a customer. Disclosure: Long INVN and AAPL. Please read the disclaimer page for more details. The value of the prizes is not determined by the number of participants.All winning outcomes reflect the relative knowledge and skill of participants.No winning outcome is based on the outcome of the score of games or the single performance of an individual athlete in a single, real-world event. E-Commerce China Dangdang Inc. (NYSE: DANG) might be a stock with a funny name to U.S. investors, but the company has been extremely hot recently. The provider of a business-to-consumer e-commerce platform in China has surged around 100% since opening at the beginning of May at around $3.80. The market for network performance appliances has become so competitive that Riverbed Technology (NASDAQ: RVBD) now trades at a below-market earnings multiple of 12. With the purchase of OPNET last year, the network performance company for globally connected enterprises is facing a weak market for network equipment while it still works to achieve the synergies promised as part of the merger. With the mobile advertising market booming, the continued collapse of Velti (VELT) has remained perplexing. The company famously faced a cash crunch due to extremely long payment terms to only collapse after seeing the EBITDA and income plunge after cutting that business. The question still remains why cut a profitable business because of slow payments. The company is a global provider of mobile marketing and advertising technology and solutions that helps brands, advertising agencies, mobile operators and media to implement mobile campaigns. For over a year now, Glu Mobile (NASDAQ: GLUU) has provided an interesting investment idea to benefit from the surge in mobile gaming due to the adoption of smartphones and wireless broadband. Along the way, though, the company continues to run into monetization and platform issues, even with seemingly popular games. Even with a fundamental shift in the airline sector, analysts are quick to downgrade US Airways Group (NYSE: LCC) at market low earnings multiples. Sure the airline industry has historically struggled to make profits, but the recent consolidation provides hopes for a liberated industry. Even after substantial gains this year, a number of financial stocks still trade below book value. While not covered back in January along with the insurers and airplane leasing firms, a cross section of other financial stocks continue to trade considerably below book value. While the fears from the financial crisis have mostly dissipated, the stocks continue to meander below book value even with strong earnings profiles. Disclosure: Long ACAS and GSVC. Please review the disclaimer page for more details. 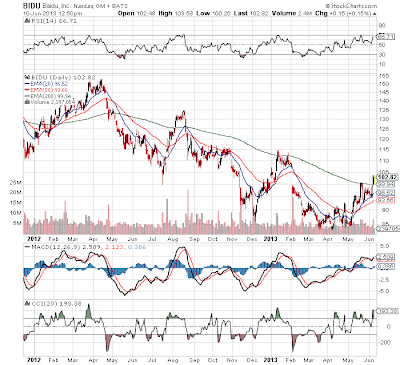 After a disappointing year it appears that Baidu (BIDU) is finally waking up. The stock has been in a major downtrend since peaking last April over $150. The stock has been a favorite of Stone Fox Capital over the last couple of months as the it dropped below $90. It currently trades at only 16x greatly reduced forward estimates. With the China internet sector still in the early days, investors can purchase the preeminent search engine in that massive country on the cheap. For comparative purposes, BIDU is worth only $36B while Google (GOOG) now approaches $300B. No doubt should exist that BIDU will approach the valuations of GOOG as the China internet market grows up. After an extremely weak year, has Body Central (BODY) finally hit bottom? The women's fashion retailer started off with good results in 2011 after an IPO at the end of 2010. The company though constantly revised down expectations in 2012 while competitors such as Francesca's Holdings Corp (FRAN) managed to continue growing at a fast pace. The company is a multi-channel, specialty retailer of woman's fashion providing quality apparel at affordable prices. It operates 281 specialty apparel stores in 26 states under the Body Central and Body Shop banners. Even with Splunk (NASDAQ: SPLK) trading down substantially from the recent market weakness, the stock is still very overvalued. The stock was one of the hottest IPOs in 2012 and recently hit all time highs while trading at ridiculously high multiples. The old saying, "where there's smoke, there's fire" applies mightily to the news on SodaStream (SODA) today. According to an Israeli website, PepsiCo Inc. (PEP) is exploring a deal that values the company at nearly $2 billion. The company is a leading manufacturer of home beverage carbonation systems sold at major retailers around the world with a primary target on growing in the Americas where soda usage is significantly higher than in Western Europe. The reports suggest that SodaStream is attempting to engage in a discussion with Coca-Cola (KO) in order to obtain the highest potential valuation. With so many details, it suggests that some form of discussion must be taking place. Typically though, the real facts get confused during the rumor spreading phase so a denial by PepsiCo might just be an indication of confusion on the actual suitor instead of a lack of a deal. NeoStem (NBS) might be a small biotech stock, yet it has numerous irons in the fire that could provide huge growth opportunities. Cell therapy has the potential to radically change how diseases are treated, and the company plans to be a leader in the area. The company develops therapies for chronic unmet medical needs around a significant IP portfolio and operates a revenue generating service division with expertise in contract manufacturing and cell banking. NeoStem has several opportunities including a cardiovascular program, a very small embryonic like (VSEL) stem cell technology, a T cell program, and a contract development arm that all provide ample abilities for success individually. The key is developing a least one division into a money-generating machine to enrich shareholders. Even with Palo Alto Networks (NYSE: PANW) trading down substantially after reporting weak earnings the stock is still overvalued. The stock was one of the hottest IPOs in 2012 and has always traded at lofty market multiples. Even after substantial gains this year, a whole slew of financial stocks still trade below book value. As written about back in January, a good portion of the insurance stocks traded close to half of book value. While the fears from the financial crisis have mostly dissipated, the stocks continue to meander below book value even with strong earnings profiles. Disclosure: Long HIG and LNC. Please review the disclaimer page for more details. While investors remain focused on surging domestic oil production, the market is missing that global oil prices remain high. With Brent trading over $100, the deepwater drillers provide attractive investment options with PE ratios below 10. Investors looking for a stock that provides large yields from owning venture capital firms should look know further than Hercules Technology Growth Capital (HTGC). The company invests primarily in senior secured debt with floating interest rates of venture capital-backed companies in tech-related markets, including technology, biotechnology, life science, and cleantech industries at all stages of development. Investors typically see venture capital firms as raising equity so the concept of venture debt is unique in the public markets. With the need to raise more money as companies take longer to exit the venture path via an IPO, debt is used to lengthen the time before the next equity round and provides negotiating leverage for higher valuations. Even at average loan rates of over 14%, the venture firms can increase returns by avoiding a dilutive VC round as long as possible.